Here we go again…attempting the impossible task of predicting the SAG Awards. Trying to gauge what 130,000 actors think is the proper criteria for what is good, great, and best, is crazy. And, of course, add to that the number of voters who either don’t care enough to vote themselves and let their children or friends vote, or care so much that they won’t vote at all if they don’t see everything. In fact, the bigger that latter group is, the more likely the winners will be more populist rather than craft based, since that “caring” group are more likely to reward more obscure performances. This is evidenced by actor’s actor films, like “Beale Street” or “Widows” not being included in any way by the nominating committee. However, there are some fantastic performances in the mix. More importantly for the ratings of the show itself, there are likely to be some great acceptance speeches as it’s hard to find a more progressively sympathetic crowd than at the SAG awards. These speeches will likely be much more personal than at the Oscars, where everyone has to thank everyone they’ve ever met in their forty-five seconds of pre-musical-accompanied podium time. For a handy-dandy play-along-at-home ballot, click here! “Escape at Dannemora” is just plain uncomfortable. “Versace”, on the other hand, was on so long ago, I still can’t believe it was from 2018. None of which is to say they were not good. More people watched “Sharp Objects” than the others combined. Normally I would say that means Adams is going to win (in spite of Clarkson’s Globe win). However, Arquette’s speech at the Globes was so great, and her character is so fully formed in its oddness, I think we’ll vote for her. Me? I voted for Emma Stone’s many characters in one of my favorite shows of the year. So…one Shakespearean performance in a movie, three performances in mini-series and one in a regular drama that shouldn’t even be in the category. To me, it’s an absolute no-brainer that Hugh Grant deserves the award (as does his co-star in the show, Ben Whishaw). That said, it’s an even bigger no-brainer that Darren Criss will actually win. And, as a side note, it’s really a shame that we didn’t get to consider Jared Harris’ performanceor Stephan James and Shea Whigham’s in two brilliantly conceived and performed miracles, “The Terror” and “Homecoming”. As I’ve stated many times over, we really need Supporting Actor categories so performers like Alex Borstein can be acknowledged without taking away nominations for brilliant performers like Issa Rae, for example. More importantly, I cannot, for the life of me, understand our unrelenting connection to “Grace and Frankie”. Ah, well. None of it matters. Brosnahan’s performance is so far and away the most impactful, artfully crafted and unforgettable, she’s got this in the bag. See above for supporting comments. This time substitute Arkin or Shalhoub or Winkler…I mean, how great would that category look? But, no, here they are in a lead category. Which means no Donald Glover (! ), Andy Samberg, Hank Azaria (Brockmire), etc. It’s kind of absurd, really. But I am happy we have moved on from W.H. Macy’s addicted clown act. I think thirty-seven wins in a row is quite enough. Anyhoo…Douglas will get it, but Hader or Shalhoub deserve it. To me, Julia Garner gives one of the great performances on television maybe ever, in season two of “Ozark”. But, truly, it is a supporting role. So, while I’m gratified that we acknowledged her, I wish Keri Russell was in this category for her cumulative work on “The Americans”. The supporting category could have included Garner, her co-star, Lisa Emery (Darlene), and “Killing Eve’s” loveable assassin, Jodie Comer. But the clear favorite (and mine as well) is Sandra Oh, who makes the reactions of an everyday person, stuck in utterly abnormal circumstances, look effortless. I simply, CANNOT understand how we didn’t nominate Matthew Rhys. To me, it is the biggest TV category omission in the history of the SAG Awards. How did we nominate the ensemble for “The Americans” and fail to nominate the Emmy, Golden Globe and Critics Choice WINNER, fer chrissakes. Ugh. And to replace him with Krasiniski, who wasn’t even the best actor in his show (looking at you, Ali Suliman) is equally criminal. Ah well. So…given what we have, the rank and file will vote for either Bateman or Brown. I voted for Odenkirk. On a coin flip, I give it to Brown for his second in a row. Okay, so I’m not a big “GLOW” fan, and even less of a “Kominsky Method” fan (“Barry” does the LA acting experience better and “Maisel” does the Jewish experience better), but I recognize that I am mostly alone in that estimation. So, I am forced to admit the Nominating committee got this mostly right. I might have put “Insecure” in there ahead of “GLOW”, along with “Brockmire”…or “Silicon Valley”…or “Brooklyn Nine-Nine”…or “Patriot”. Regardless, at least there is no “Orange Is the New Black” or “Modern Family”…so there’s that. Oh, RIGHT…predictions! “Maisel”, duh! Okay…all good choices. “The Americans” is one of the great series in history. Which, for the SAG’s means nothing. It’s either “Ozark” or “This Is Us”. “Ozark” deserves it more. “This Is Us” will win. So let’s pretend Regina King DIDN’T give the best supporting performance of the year in “Beale Street”. And let’s pretend Elizabieth Debicki wasn’t right on her heels in “Widows”. A friend described “The Favourite” as a tripod. Take away one performance, it falls to the ground. Perfectly put….and why I think either Weisz or Stone should win. In fact, a third of the people I’ve talked to are voting for Rachel Weisz, a third for Stone, and a third for Amy Adams. Which means Amy Adams takes it. Personally I thought Weisz gave the most effortlessly complex performance of the year in this category – and the only to rival King or Debicki. A REALLY tough category. I MIGHT have put in Daniel Kaluuya, Daid Henry Tyree or Robert Duvall from “Widows” or Michael B. Jordan for his brilliant “Black Panther” effort in my Top Five. Regardless, all the nominees are terrific. I voted for Adam Driver because I thought he had the most weight to carry in his terrific film and, as a result, I empathized with his character more than the others. But I think it’s a slam dunk for the terminally underappreciated Grant. Do we really think Emily Blunt was better in “Poppins” than Olivia Davis was in “Widows”? Okeedokee. 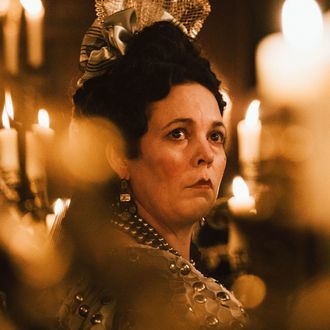 Olivia Colman is utterly fascinating, unbelievable, heart-rending, and gleefully fabulous in a terrific film (“The Favourite”). Glenn Close is utterly fascinating, unbelievable, heart-rending, and undeniably universal in a NOT-so-terrific film. Flip a coin. I voted for Colman and I think we’ll reward her, but I’d not be surprised at all if we gave it to Close. Listen, I loved “BlacKKKlansmen”. Easily in my Top Five. That said, Washington’s character is largely plot supportive. Ethan Hawke or Willem Dafoe make more sense to me, but it’s certainly not an egregious decision. In this category I really thought Mortenson gave the most complete performance in the best movie of the four not called “BlacKKKlansmen”. But I acknowledge the brilliance of Bale and Malek’s transformations. This largely comes down to who voted more often…actors or family & friends. Actors will choose Bale, the others, Malek (and, no, I’m not trying to insult those actors who voted for Malek – just pointing out whose votes will be tipping the scales). This is such a mind-numbingly strange collection of films given those that were left off the ballot (“Widows”, “Beale Street”, “First Man”, “Roma”, “The Favourite”), I almost didn’t vote in protest. But, that would have been a cop-out. The best ENSEMBLE of the bunch, to me, is “BlacKKKlansmen”, followed by “A Star Is Born” and then “Panther”. But I think the actual award will go to either “Panther” or “Rhapsody”. I’m guessing “Rhapsody” takes it. I mean…”The Mission Impossible” films are impossibly real looking in their impossible stunts. That said, “Panther” has to be the pick, right? Have fun!!! See you at the Oscars!